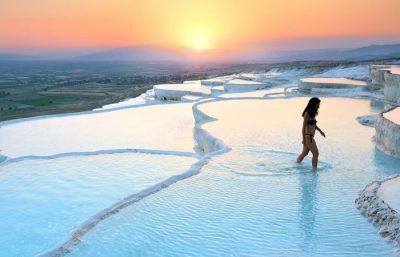 If you want to have some unique fun and visit some truly magnificent places, then Marmaris Pamukkale Tour is just what you need. 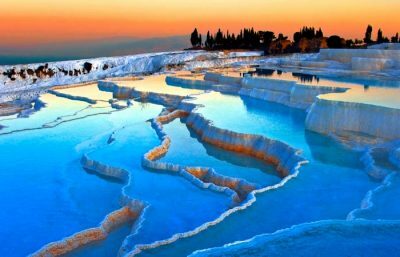 You will admire the power and uniqueness of the Mother Nature when you see white cliffs of Pamukkale. It is the day which you will never forget in your life. 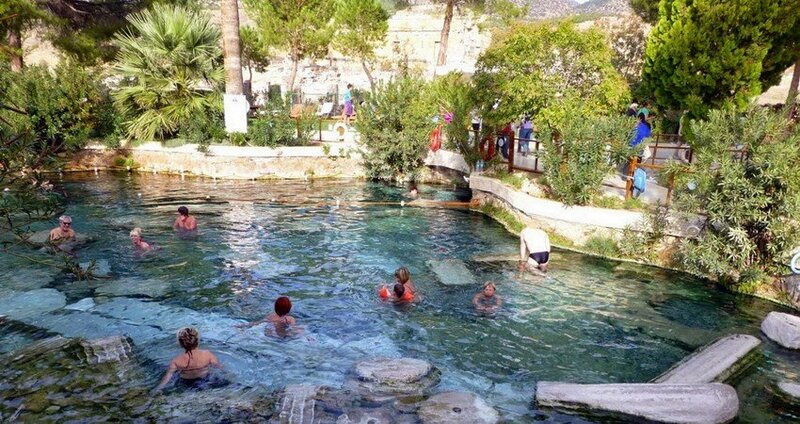 Our fascinating Marmaris Pamukkale Tour starts with a pick-up service from your accommodation in Marmaris. 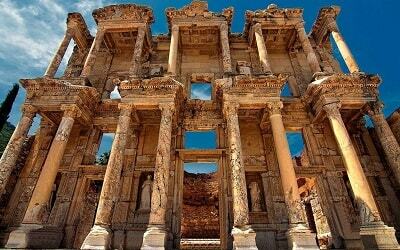 After a pleasant drive to the charming town of Mugla, where you will enjoy a tasty open buffet breakfast in a local restaurant, then we will take a comfortable two-hour bus trip to Pamukkale. 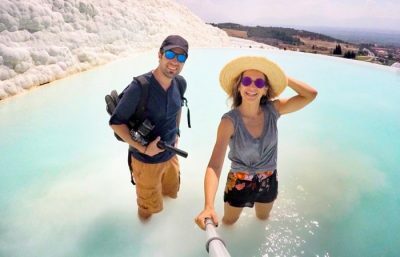 During Marmaris Pamukkale Tour our professional English-speaking guide will tell you some details about our destination and its most important traits. 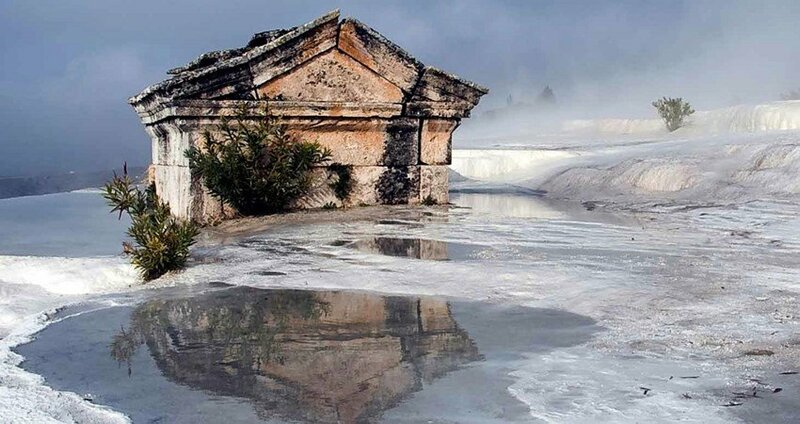 Upon the arrival to Pamukkale, we will take a stroll through the glorious Hierapolis. 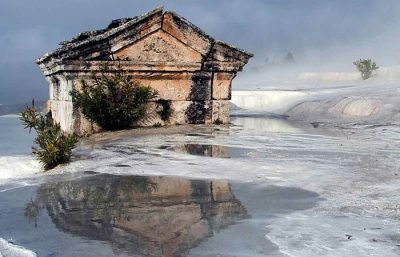 This magnificent ancient city was built on top of thermal springs, which were once used as a spa. 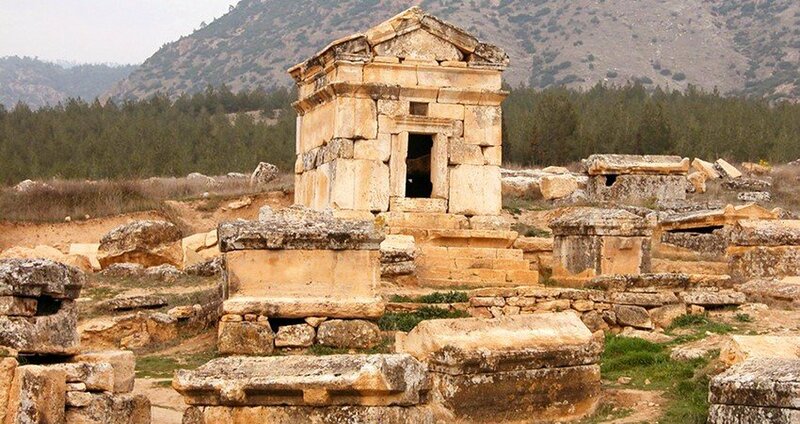 The impressive ruins of the baths are still visible and absolutely breathtaking. 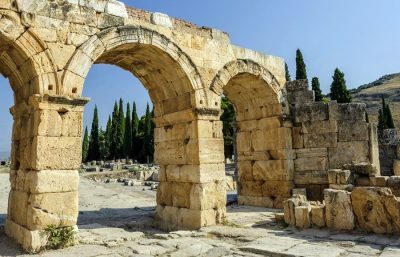 You will also get to visit some ancient temples and Roman historical monuments, such as the Theatre, Temple of Apollo Roman Baths and many more. Basicaly this tour will give you a unique opportunity to see a part of the Roman Empire, which is one of the most powerful empires in the history of the mankind. 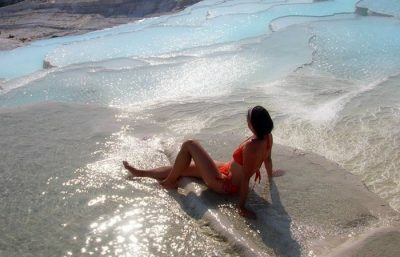 Pamukkale is a unique phenomenon. Its captivating landscape is made by mineral forests, calcite-laden waters, gorgeous petrified waterfalls and lovely terraced basins. 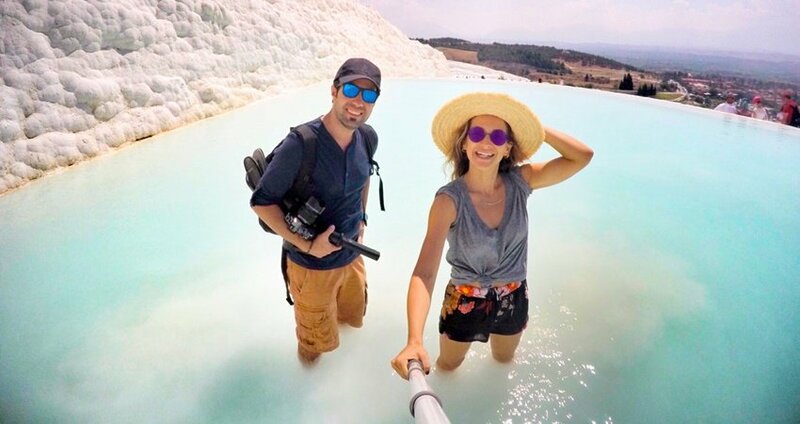 Once you walk through Pamukkale, you will feel like you’ve walked through a fairytale. 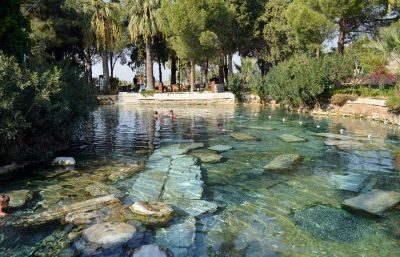 Astonishing, gorgeous white travertines, and a refreshing swim in the antique Roman pool, will make anyone swoon with pleasure. 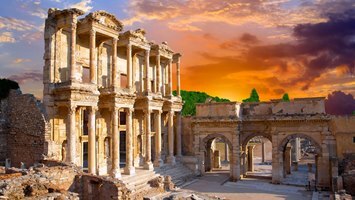 After this fantastic trip through history ends, we will take a short and cozy bus drive to the charming little Village of Pamukkale, where we will enjoy a delectable open buffet lunch in a local restaurant. Once the lunch is over, we will visit an Onyx Workshop, where we will get a chance to see how this high-quality stone, rich with minerals is processed. Afterwards, our driver will take you back to your hotel in Marmaris. 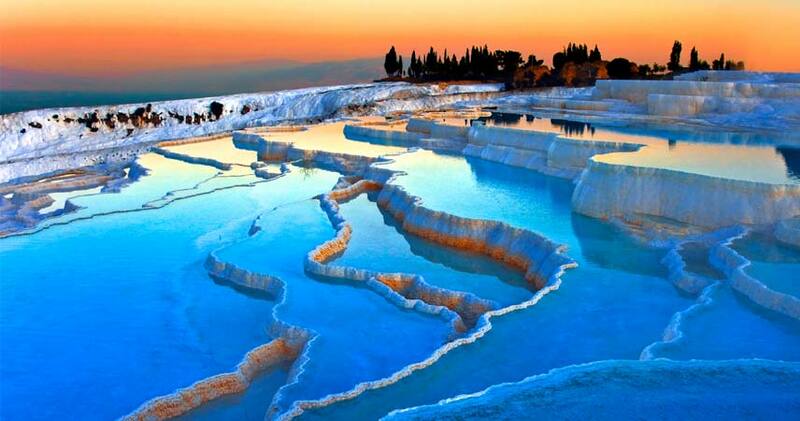 If you like to visit Pamukkale in the early morning hours, please also check 2 Days Trip from Marmaris. 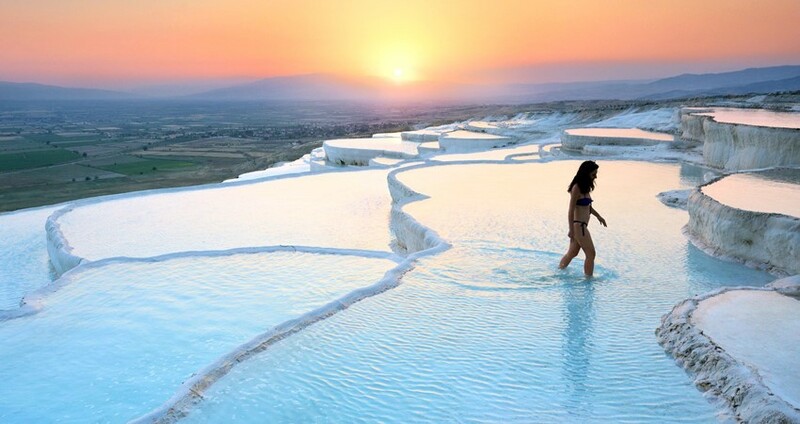 Within Marmaris Pamukkale Tour, our first break will be in the charming province of Mugla. There, we will have a delectable open buffet breakfast in the local restaurant. We will be having a traditional Turkish breakfast, and you will also get a complementary tea or coffee. This lovely breakfast is included in the price. You will be driving in our spacious busses equipped with air-conditioning systems and comfortable seats. 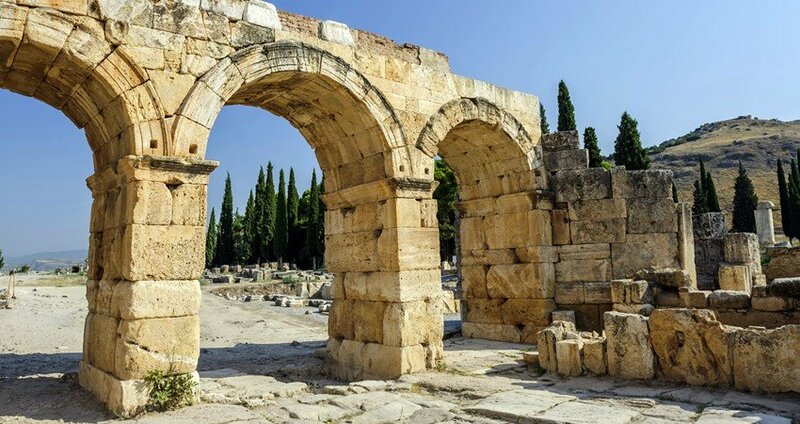 Nevertheless, a drive to Pamukkale is a long one, so we will be having a 30-minute break in Denizli, where you will be able to use the toilets and freshen up, before we continue with our trip. 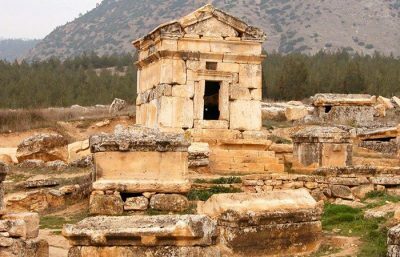 The visit itself will last for about three hours, during which you will get to take a stroll through the ancient city of Hierapolis and hear some amazing stories about its history. Our guides will be there to tell you all you need to know about this beautiful place and its history and legends. You will also get a chance to visit the captivating white travertines, a unique phenomenon formed by calcified waterfalls that look like they have been frozen in time. 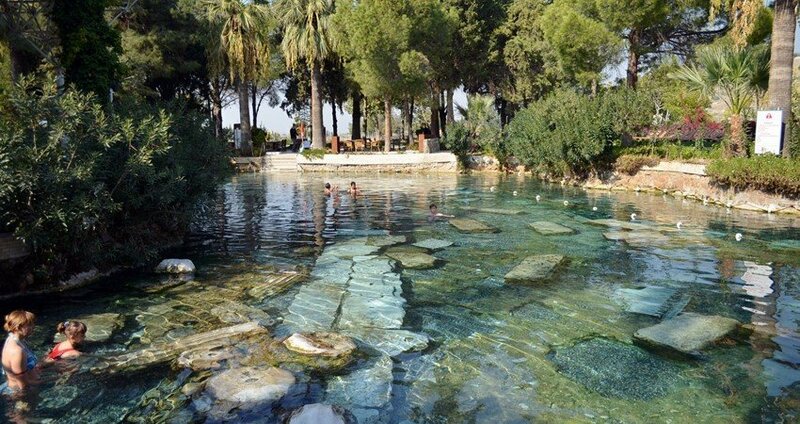 You will also get to take a relaxing dip in the amazing thermal pools, one of which is the famous Cleopatra’s pool. After our exploration of Pamukkale is over, we will have a delicious open buffet lunch in a modern local restaurant. Lunch usually consists of a cold appetizer, followed by a main course, and topped by some tasty sweet and some fruit. 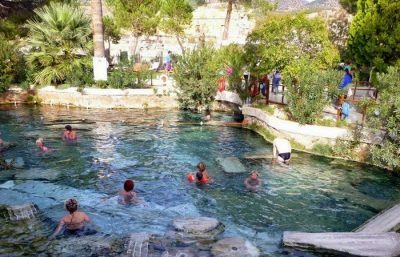 During Marmaris Pamukkale Tour Lunch is included in the price. 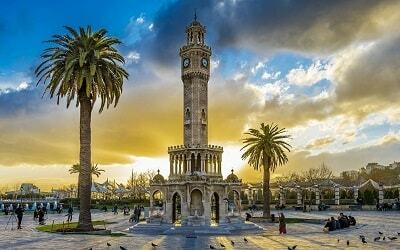 We usually arrive at Marmaris at approximately 19.30 in the afternoon. 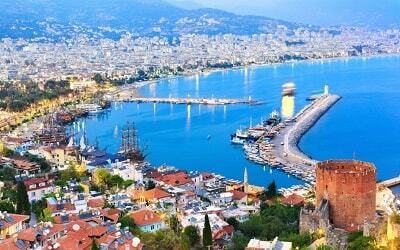 Upon our arrival, you will be dropped back to your hotel in Marmaris. We should also note that transfers from your hotel and back, are also included in the price. 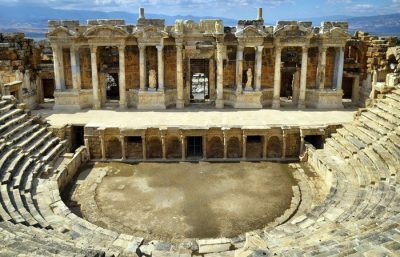 Four of us went on the Marmaris Pamukkale tour. We had a great time during the tour with our friendly guide. 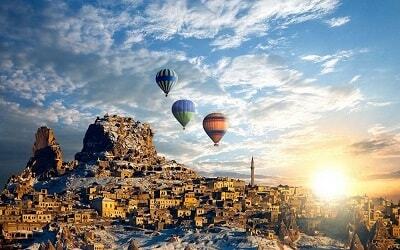 He was very knowledgeable about Pamukkale and a good story teller. He was extremely nice and funny. The tour itself was great. 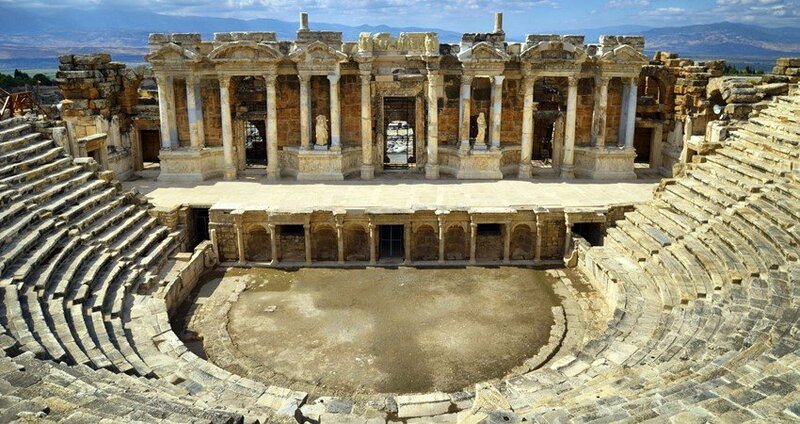 Even it is a long drive the visit to the Pamukkale was beautiful, and visited a few old archaeological sites. Very beautiful day trip overall. Very glad we did it!